On April 14, at approximately 8:00 p.m., officers from the Special Enforcement Unit (Gang Unit) conducted a probation search of a subject stemming from an earlier traffic stop in the city of Oxnard where upon the driver was arrested for an outstanding misdemeanor warrant. The subject involved in the stop and arrest was identified as Agustine Ruelas. Ruelas is on active probation and subject to the search of his person or residence. He is also a convicted felon and prohibited from possessing any firearms or ammunition. 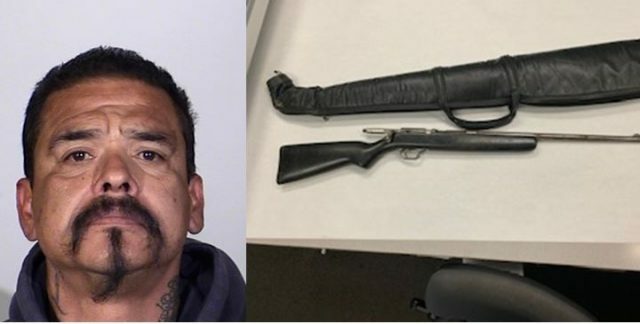 During the search of his personal belongings at his residence, officers located a bolt action 410 gauge shotgun. Ruelas was additionally charged with being a convicted felon in control of a firearm. Anyone with information regarding this case or other criminal activity is encouraged to contact the Oxnard Police Department at (805) 385-7600, or online via the Oxnard Police Department’s website: www.oxnardpd.org, and clicking on Report Suspicious Activity. You can remain anonymous if you choose to do so. You can also remain anonymous by calling the Ventura County Crime Stoppers at (800) 222-8477. You can also visit this site: www.venturacountycrimestoppers.org t to submit a tip via text or email.